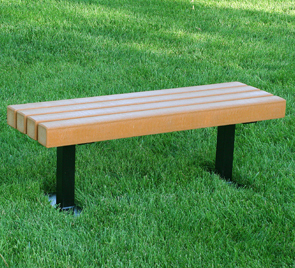 These recycled plastic outdoor benches are environmentally friendly and available in several lengths to suit your needs. They are very low-maintenance and were designed to be placed in service and left alone. Made with 4" x 4" recycled plastic Resinwood slats and heavy-duty powder-coated structural steel frames. Surface mount bench frames include pre-drilled holes for surface mounting.